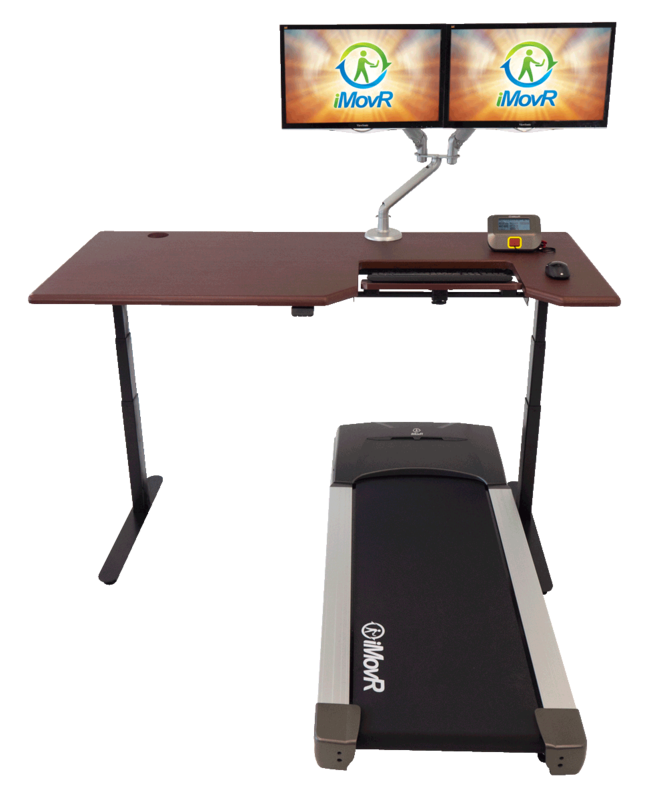 iMovR's Lander Treadmill Desk series combines our flagship standing desk with the state of the art ThermoTread GT Office Treadmill. Both pieces of the workstation are engineered from the ground up for an ergonomic work experience at the office. Both the Lander Desk and the ThermoTread GT feature hushed motorworks. Switch between sitting, standing, and walking without disturbing your coworkers. The Lander's app-compatible paddle controller, in concert with the Treadmill's LCD console, represent the cutting edge in office fitness technology. Ships 98% pre-assembled, saving you (or your organization) the time and hassle of putting the desk together—so you can start using your treadmill desk within minutes of arrival. Eclipsing the entire field of imported, commodity standing desks with its inspired American engineering and ergo-contoured styling, iMovR’s new line of Lander standing desks is unlike any you’ve ever seen before. You will find no other desks matching the Landers’ technological prowess, quality of components, versatility, and ease of use – at any price. More than just dumb furniture, Lander desks have a built-in health coach to make sure you remember to change positions at optimal times throughout the day, without disturbing your productivity. Beauty, smarts and personality… what more could you ask for? Select from hundreds of size-and-color variations to best match your workspace, accessorize it to your heart’s content, and receive your ergonomically-customized standing desk in just two weeks or less. Leaving nothing to chance when it comes to your successful transition to a healthier work posture, your desk will land at your doorstep factory-tested and 98% pre-assembled – so that anyone can put it together in just minutes, no tools required. Watch this video to see just how easy it is! Tap the intuitive height paddle to move the desk smoothly and silently to any pre-assigned height, or to set subtle visual reminders to stand. Or, download the free app to control the desk from any smartphone, and enjoy a host of new features with free updates in the future. Stronger, faster, smarter, quieter and more reliable than any other electric standing desk, the Lander is made in the USA and backed by the best warranty in the business*. Shipping is FREE to anywhere in the continental USA. We’re so confident you’ll fall head over heels in love with your new Lander Desk that we back it with our exclusive 100-Day Satisfaction Guarantee**. *The Lander Desk comes with a ten year warranty on all base components, and five years on the 3D laminated desktop. *100-Day Satisfaction Guarantee: If you’re not completely satisfied with your Lander Desk return it in good condition in its original packaging (the Lander disassembles in just minutes) within 100 days, for a full refund minus a 20% re-stocking charge.